The ones in the photo above are since sold out, but here’s a fairly similar version. The exact high tops in the photo above have since sold out but these are a super similar pair. Last, what I truly LUV about them… Not everyone understands why someone would pay so much for a pair of “distressed” shoes. But how many of you buy distressed jeans and sweaters, etc.? It’s a new trend in the shoe department, but not for fashion as a whole. They’re also SUPER well made. They’re all hand-crafted and they are THE MOST comfortable shoes you will ever put on your feet! PROMISE! They have never given me blisters; I can wear them all day comfortably; AND I genuinely just think they make any outfit look cute. So, there’s that. I truly believe adding these shoes to your wardrobe is an investment. I think them to be collectors items and I LUV them more than any other shoe I have. While others invest in expensive designer high heels, I invest in comfortable designer flats. Because… mom life. These are maybe my fav pair of the moment. I absolutely LUV the studs and they they work for any season! These leopard ones are also a FAV that will go with EVERYTHING! But high tops are still my fav and you can’t go wrong with these simple white ones! 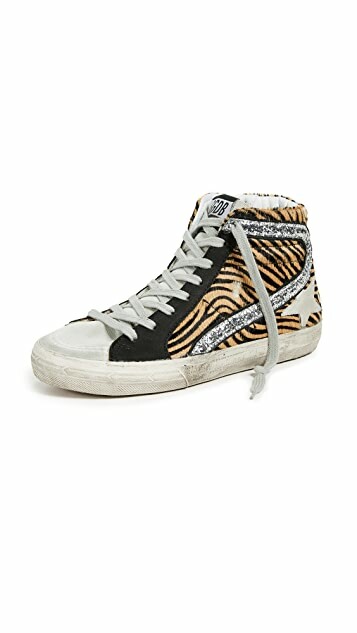 These are close to my very fav hightops! LUV! I also have these pool slides on my fav things list! If the items I’ve mentioned have since sold out, here is a list of the places I keep an eye out for them on sale, so keep checking back by clicking on the store names below. To see what might be on sale, list the items from price low to high and see what’s currently available! I also found these dupes for kids that are SO CUTE! *Affiliate links were used in this post, which means I get a commission if you use links at my recommendation. Thanks, as always, for your support.